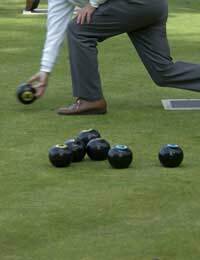 At one time bowling greens could be found in a great many public parks in the United Kingdom. Unfortunately, greens take a great deal of time and effort to maintain. On top of that, bowls is viewed as very much a minority sport. As a result, when budget cuts have been the order of the day in local council chambers, the green has too often been one of the first casualties. However, some public greens do exist, so it is worth contacting your local council for more information. It is also a good idea to visit some of the local pubs because one or more of them may keep a well maintained green if the regulars have a league team. If this is the case, pop along when the next match is scheduled. If you are lucky and the sun is out, sit back and relax with a glass of whatever you fancy and drink in the understated drama that is a competitive game of bowls. Take the time also to speak to the club organiser about how to get involved. Another good point of contact may be your local cricket club which may well have a green that is accessible to members and is subject to a joining fee. The same will apply to clubs dedicated to the sport, whether it be lawn bowls or crown green. Fees vary but a good benchmark is around £60 per year. You may find that one or more existing members are needed to sponsor a new recruit. This is fine if you happen to know a few of these members or are related to the club captain. But what do you do if you have no connections? Any reasonable club should not be turning away new blood. The policy is likely to exist solely for the purposes of keeping out more unruly individuals so be prepared to put your case for being admitted, and if need be volunteer to be interviewed. A good start is to look in a local directory or an online directory to find bowling clubs within your area - check the listings in the sports club & associations section. Similar information should be available via an internet search engine. The web also carries information on the sport’s governing bodies. pAs well as providing good facilities, many clubs have a resident coach. This means new members can book lessons, thereby offering the opportunity to get off on the right foot, while more experienced players can seek advice about improving their performances. Of course, a club environment means you will be socialising with fellow bowlers, offering the chance to share your love of the game with others. One piece of advice: don’t go beating too many of your new friends because under the mild mannered exterior of most bowlers lies a proud heart and a fierce will to win.